Singapore: Gold traded near two-month low on Wednesday as the first US government shutdown in 17 years caused investors to sell the precious metal, prompting already jittery traders to believe there could be more liquidation. Bullion, which has lost about 23 percent of its value this year largely on fears over a US stimulus cutback, fell 3 percent on Tuesday following a massive Comex sell order and technical selling once prices fell below USD 1,300 an ounce. Gold is typically considered a safe-haven asset in times of an uncertain economy and geopolitical tensions. Prolonged politicking around the US budget had initially prompted some investors to believe gold could go up, but safe-haven bids failed to emerge. "If the government shuts down and people start to save money, why should it be supportive for gold?" said Dominic Schnider, an analyst at UBS Wealth Management in Singapore. "You don't want to own gold because the cutback could negatively affect the economy and purchasing power is being impaired." Spot gold had edged up 0.4 percent to USD 1,291.44 an ounce by 0320 GMT. It had fallen to USD 1,278.24 earlier in the session, its lowest since Aug. 7. The sharp slide in New York stirred market talk of forced liquidation by a distressed commodities fund and of selling related to a fund rebalancing on the first day of the third quarter, although no details could be confirmed. "A lot of people are scratching their heads because of the aggressive selling. It was a big surprise as no one was expecting this reaction" said a Hong Kong-based precious metals trader. "You have to react to this selling pressure and I think there is going to be more." 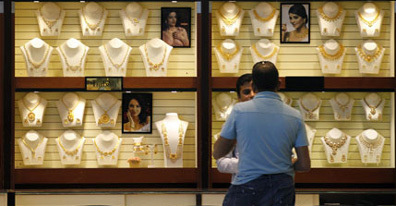 Analysts said the next support for gold was at around USD 1,270 an ounce. With key buyer China out for the National Day holidays through Oct. 7, traders do not expect prices to bounce back strongly. The US government began a partial shutdown on Tuesday after Congress failed to agree on a spending bill. President Barack Obama accused Republicans of taking the government hostage in order to sabotage his signature healthcare law. A week-long shutdown would slow US economic growth by about 0.3 percentage points, according to Goldman Sachs, but a longer disruption could weigh on the economy more heavily as furloughed workers scale back personal spending. Some gold traders said the possible impact on the economy and more political drama around raising the US debt ceiling by mid-October could prompt the Federal Reserve to delay the tapering of its bond-buying stimulus, and turn sentiment towards gold more positive. But a lot also hinges on seasonal physical demand in China and India towards the end of the year. So far, demand has been muted, dealers said.